If you are looking at a Natal Chart that I wrote for you, the QUINCUNX a.k.a. INCONJUNCT LINES in the middle of your Chart Wheel will be the color RED. Check your Natal Chart for a Quincunx! 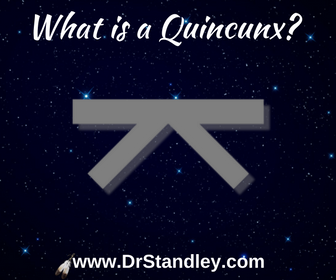 Remember, quincunx means 'integration.' The quincunx is asking you to change something or make an adjustment in the 2 houses where the planets sit that create the quincunx. A quincunx is a 150Â° angle (8Â° "orb" or less). In medical astrology, the orb is said to be (2Â° to 5Â° degrees) and is considered the most important aspect in the chart. The quincunx glyph looks like a semisextile that is upside down. A quincunx is often described as 'being between a rock and a hard place.' Therefore, the quincunx is described as a "hard" aspect, meaning it brings challenge. And challenges eventually build a stronger character. Through your own inflexibility, the quincunx will teach you to either "bend" or "break." Either way, you'll learn. And whether you learn the easy way or the hard way is certainly up to you. A quincunx is thought to be one of the most difficult aspects to work with because it will not allow for retreat. There's no backing down when it comes to this aspect because you can't just think your way out of it, you have to take action on those thoughts. The quincunx will challenge you to trust your own intuition. Intuition is a very big deal when it comes to quincunx'. Remember, 2 quincunx plus 1 sextile makes a 'Yod,' which means the 'Finger of God.' Couple the intuition with the 'Yod' and you have a blast of intuition coming through to your "I AM" presence. This is your inner voice, which is God speaking to you and through you. The quincunx is asking you to trust your inner voice. Use that intuition, so that you can change the dynamics going on in your Life. When you change the dynamics, then transformation takes place. When transformation takes place, then integration occurs. You will integrate "you" into your Life path instead of standing on the sidelines waiting for something to do it for you. You must do it. If you just flat out refuse to trust yourself; refuse to trust your intuition or refuse to listen to your inner voice, gut instinct and hunches, then you will only find adversity and your adversaries staring you in the face. And if find yourself eye to eye with adversity or an adversary, believe me, you'll be the one blinking first. Trust your intuition and then integrate it! Look at the nature of the planets involved, then work that Quincunx!